Guess what, guys!!!! I went to St. Louis with my family. My uncle and his family live there. My nice uncle is named Marc and he is a fan of the Panclog. He wanted me to get the most out of my trip to the STL, so he recommended that I Panclog while there. He suggested we go to Eckert’s Orchard before we went to a Cardinals game. Eckert’s Orchard is located at 951 South Greenmount Road. Belleville, IL 62220. Eckert’s has a country store, garden center, restaurant, and a custard shop all on their farm. You can visit their website. Give them a follow and a like. Location/Environment: Eckert’s Orchard is laid out on the corner of the orchard. This gives it a very rural feel due to the fact that you cant see any other buildings. This is not a bad thing at all. The environment tries to incorporate the plenty copied down-home country feel. Eckert’s pulls it off easily. We checked in and were told that the wait would be 30 minutes. While waiting the family clan wandered over to the country store. The store gave out many samples that I, to my future demise, enjoyed. Service: I was incredibly pleased by the staff’s amazing service. They must have noticed that I was not there to mess around. The server noticed that I was taking pictures with my food and they kindly provided me with props. While you are waiting for your food, the server gives the table a basket of fresh biscuits and some apple butter. These are delicious. I truly love when restaurants use paper for their table cloths. This proved beneficial because I could write my notes right next to the food. Menu/Selection: Eckert’s Orchard Cafe & Grille is open from 7:00 am to 8:30 pm. They offer every meal. The menu ranges from pancakes that can feed families to homemade soups. They serve everything you would want for breakfast and also hearty country meals like chicken pot pie. Anyone you take will find something they like eating. Check out their full menu here. “No kidding – a buttermilk pancake the size of a pizza. Perfect for a pancake lover to conquer alone or for the whole family to share.” This is the actual description of the Pizza Pancake from the menu. It was the size of a pizza. It was approximately 16″ of goodness. The pancake itself was a thin buttermilk. I could only imagine how long it would take to cook if the pancake were any thicker. The sweet cream was something you might find on a fruit pizza. 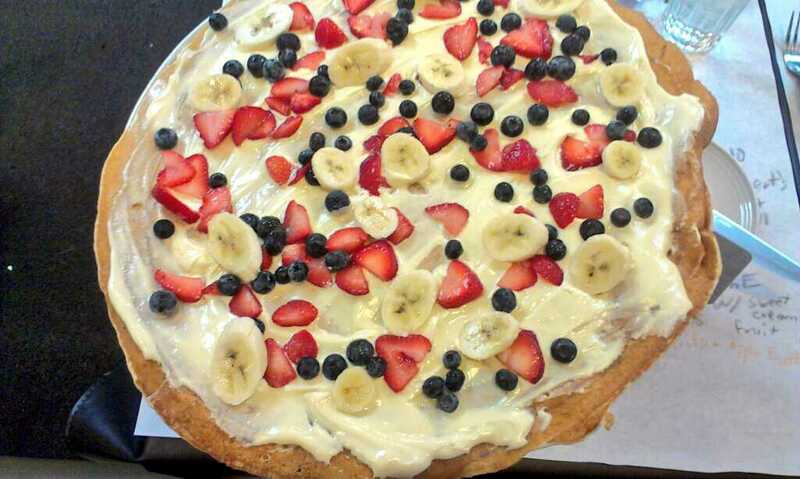 And once you put the fresh berries on, you basically have a pancake fruit pizza. It is glorious. 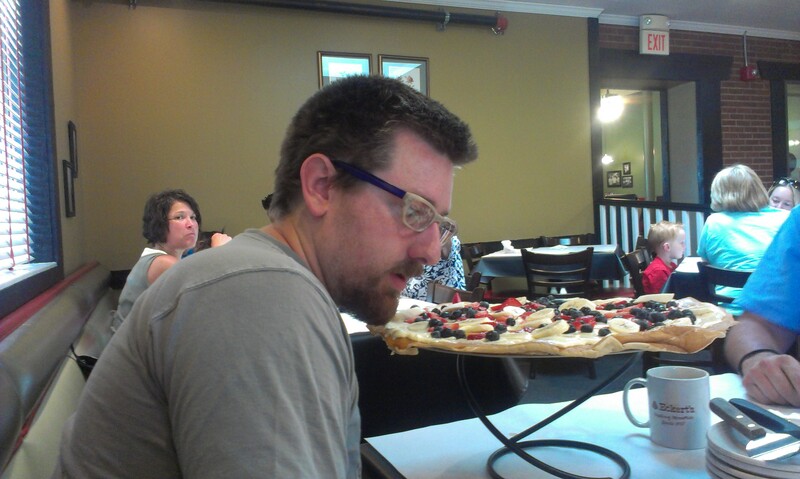 The pizza pancake is served on a pizza tray. They give you a bottle of syrup, but I barely used it. The sweet cream is enough to keep your sweet tooth satisfied. I nearly finished this amazing pizza all by myself. I could have finished it, but i foolishly tried too many samples and plenty of those biscuits with apple butter. I just left a few bites on the table. Price: Eckert’s has good value to their food. They seem to make everything they can in house. My Pizza Pancake was $12.50. You can just get the huge pancake with no topping for $8.50. The $12.50 is definitely worth it for the size of meal you get. It even tells you to split it in the menu description. Overall: Eckert’s was an incredibly enjoyable Panclog experience. I truly recommend this orchard for a nice family outing with tasty food. I want to thank my family for supporting me and not making fun of me when I eat WAY too many pancakes. Thank you Huth family for the place to stay and the great Panclog food. You can follow Jared and Panclog on Twitter.